Sidney Howe was the youngest of three sons of (Philip) Robert Howe, a coach painter, and Kate Howe, née Field, who lived at 24 Waterloo Road during WW1, but afterwards moved to 12 Southcourt Avenue, Linslade. He was the younger brother, by eighteen months, of Pte Albert Victor Howe 26398, 5th Bn., Oxford and Bucks Light Infantry, who was killed on 3 May 1917, aged 20, and is commemorated on the Arras Memorial. Kate Howe’s father William Field, Sidney’s grandfather, was landlord of the White Horse Inn in New Road for many years, and a farmer; and her brother, Sidney’s uncle, also William Field, was landlord of The Wheatsheaf in North Street, Leighton Buzzard, until his early death in 1901. Sidney’s other grandfather, Philip Howe was a gardener and Sidney’s father, Robert Howe, was born and brought up in Wing Road, Linslade. As well as their three sons, Robert and Kate Howe had two other children who died in infancy: Kate, aged one day, in November 1893 and Frederick Macdonald, aged 13 months, in November 1901. When called up in June 1917 Sidney joined the 50th Battalion, Machine Gun Corps and reached France in April 1918. At that time the 50th Bn. MGC, part of the 50th Division, had been sent south after heavy fighting in Flanders to a supposedly quieter part of the line for recuperation and the training of new recruits. Sidney Howe is likely to have been in the new draft. Towards the end of April the 50th Division were ordered into the line in the Aisne area and the 50th Bn. MGC had been continuously in the front line trenches, near Craonnelle about 30km north west of Reims for almost three weeks before the Germans launched a ferocious attack on 27 May 1918. This was the start of the Third Battle of the Aisne, which lasted until 6 June, and was the final, almost successful, attempt by the Germans to win WW1, before the US Army arrived in France. Pte Sidney Howe was one of those reported missing on the first day of the battle. The Register of Soldiers Effects describes Sidney Howe as “presumed dead”, suggesting that his whereabouts were unknown in 1919, but he did have a grave. In late 1920 his remains were exhumed and reinterred in Vendresse British Cemetery, which was made after the Armistice, during the concentration of graves from small cemeteries and from battlefields. 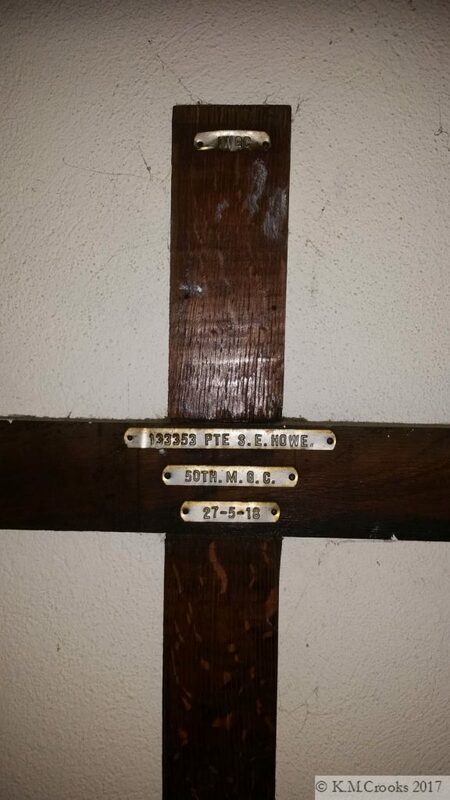 He was identified by the wooden cross which marked his grave and is now mounted on the wall of St Barnabas’ Church next to the War Memorial. 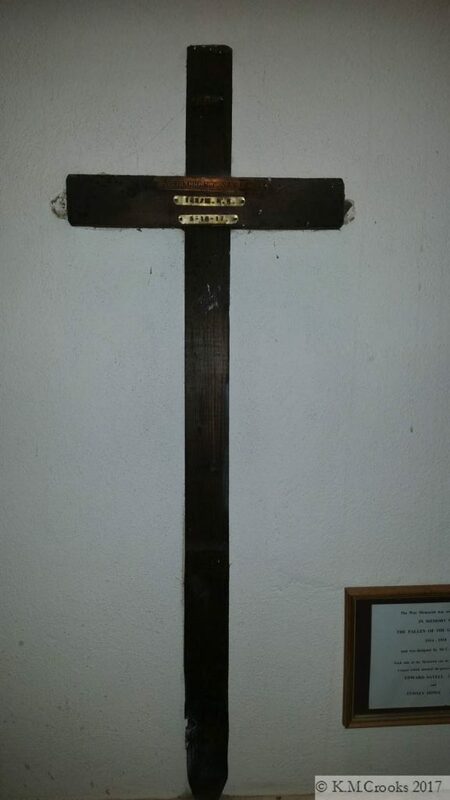 Families could ask for the return of a “battlefield cross” but they had to pay for shipping. 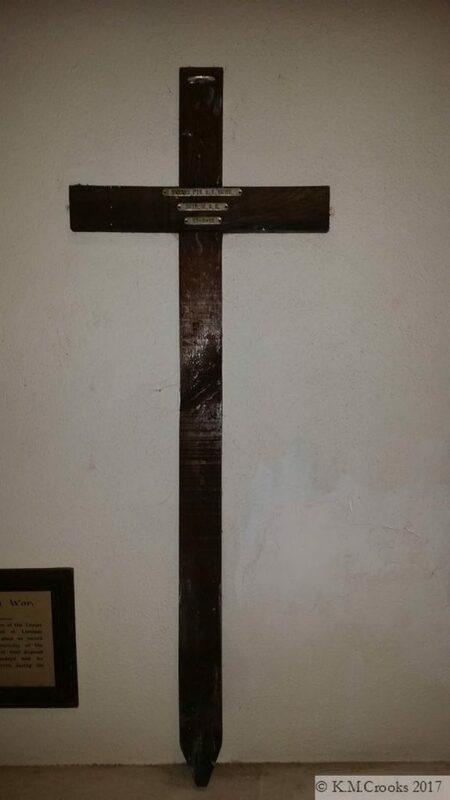 Many crosses that were returned were mounted in churches, but they are quite unusual. His parents probably chose to do this as Sidney Howe had been a Server at St Barnabas’. His name (Sid) is also on the headstone of his parents’ grave at St Mary’s, Old Linslade. Regiment/Service: Machine Gun Corps (Infantry) 50th Bn. Grave Reference: I. H. 13. Additional Information: Son of Robert Howe, of “Bordighera,” Southcott Avenue, Linslade, Bucks, and the late Kate Howe. How was subject to a concentration of graves at Vendresse. His original burial spot had a cross, it was located at 298.9.x.212.4, we currently have no position for this. Photos and survey courtesy of Kate Crooks. Biographies © Kate Crooks. The Name plate GRU tag on this cross have been replaced with a non standard tag. Edward Thomas Sayell was the fourth of nine children of Walter and Elizabeth Louisa Sayell. Walter was a house painter, born in Slapton; Elizabeth (née Jellis) was born in Horton and the Sayells lived in both those villages before moving to Linslade in about 1895, first to Wing Road and then to 39 Springfield Road. There were six boys in the Sayell family, five of whom were old enough to serve during WW1. Edward and his younger brother Arthur William both appear to have volunteered under the “Derby”, or Group Scheme, which was instigated when the flow of volunteers to the Army began to dry up. Under this scheme, men volunteered and were Attested, but were then sent home until their “group” was called up. Edward and Arthur were both Attested in late 1915, but did not begin their military service for three or four months. Edward, a house painter like his father, joined the Oxfordshire and Buckinghamshire Light Infantry before being transferred, in May 1916, to 143rd Company, Machine Gun Corps, already promoted to Corporal. He reached France in late July 1916. 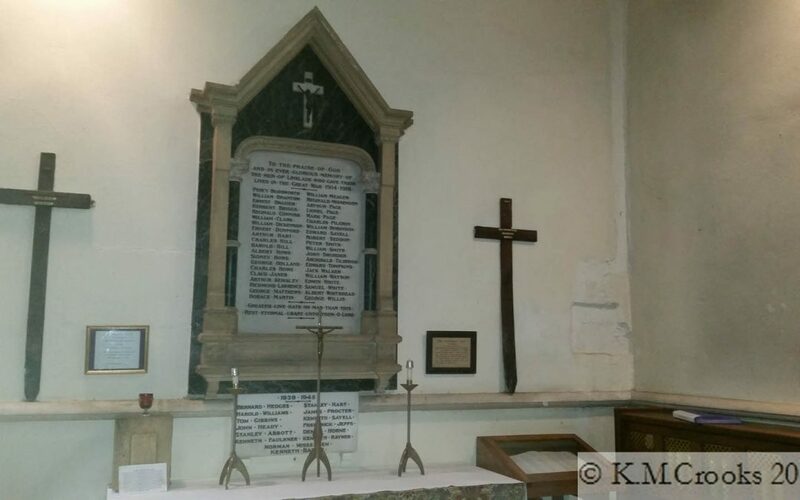 According to his Service Records, between then and when he died he was wounded at least twice and suffered from “concussion”; in the March 1917 Linslade Parish Magazine the Vicar wrote that better news had been received of Cpl E Sayell, who was “suffering from shell-shock”. 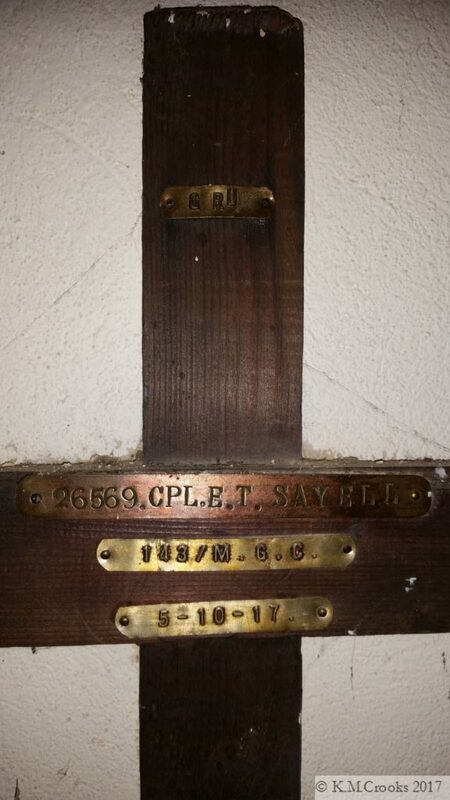 Cpl Sayell was probably fatally wounded near St Julien during the Battle of Broodseinde, part of the Battle of Passchendaele. He was evacuated to a casualty clearing station where he died and was buried in Dozinghem Military Cemetery. Edward Sayell left a widow, Minnie Daisy May (née Horne), who had continued to live with her grandmother at 6 Summer Street, Leighton Buzzard after their marriage on 15 July 1916. She hadn’t seen her husband since he left for France a few days after their wedding. She later remarried and remained in Leighton Buzzard throughout her life. The Sayells were active members of St Barnabas’ Church and well known to Rev’d W S Mahony, who kept in touch with them throughout their military service, and held a memorial service for Edward. Edward’s brothers survived, although Frederick was wounded and Arthur was held in Germany as a Prisoner of War. They also had a sister, Florence Elizabeth, in Queen Alexandra’s Imperial Military Nursing Service Reserve, who served in Salonika and in Italy. She was Mentioned in Dispatches in 1917, and was therefore entitled to wear the Oak Leaf emblem on her Victory Medal. 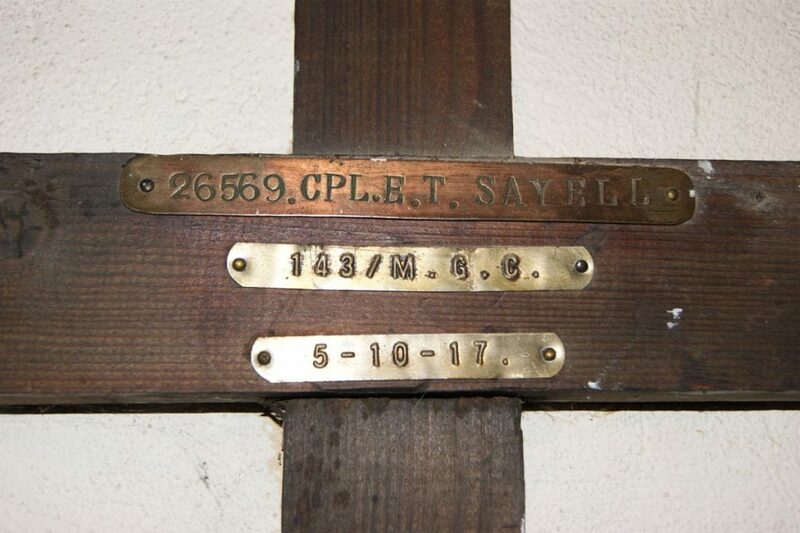 As well as his name on the St Barnabas War Memorial, Edward Sayell is commemorated by his “battlefield cross” mounted on the wall. These wooden crosses were returned to the family, on request, when replaced by a permanent white headstone. 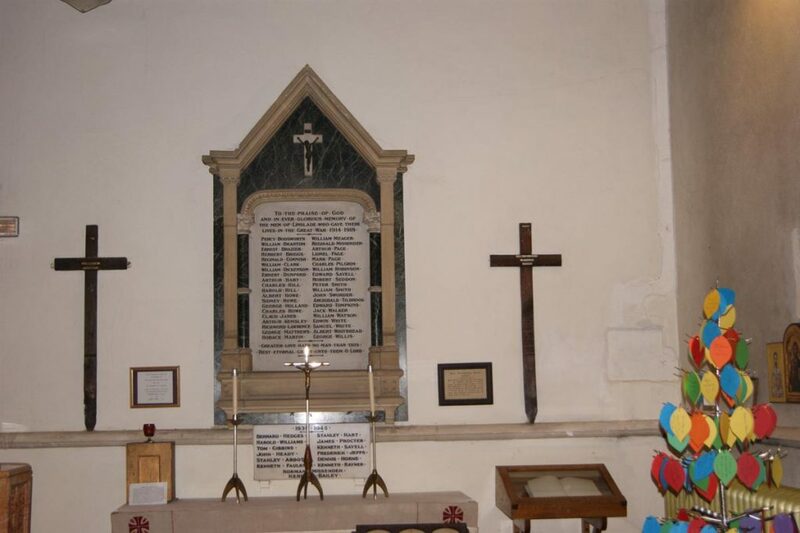 Two of his brothers, Sidney and Walter also have plaques on the choir stalls. Both were members of the PCC for over twenty years, and both were choirmen for over sixty years. The WW2 section of the Memorial includes another member of the family. Kenneth James Sayell, a Trooper in the Royal Tank Regiment was killed on 19 July 1944, aged 20, in the fighting following the D Day landings. He was Edward’s nephew, the only child of Edward’s brother Frank Sayell and his wife Mildred (née Green). Regiment/Service: Machine Gun Corps (Infantry) 143rd Coy. Photo courtesy of Andrew Hamilton.